My Thoughts: org.openqa.selenium.remote.SessionNotFoundException:Unexpected error launching Internet Explorer. Protected Mode settings are not the same for all zones. org.openqa.selenium.remote.SessionNotFoundException:Unexpected error launching Internet Explorer. Protected Mode settings are not the same for all zones. >> Open IE , then go to Tools>>Security tab . >>Now either check or uncheck the "Enable Protected Mode" checkbox for all zones i.e Internet , Local internet, Trusted Sites, Restricted Sites. Make sure you have enabled "Protected mode" in all 4 zones. The below error will come if and only if the protected mode flag is not same for all zones . "Unexpected error launching Internet Explorer. Protected Mode settings are not the same for all zones. 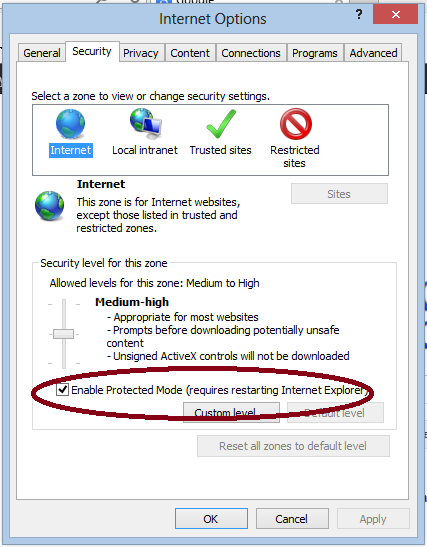 Enable Protected Mode must be set to the same value (enabled or disabled) for all zones" . yesterday I tried running webdriver as remote web driver. May be that caused this issue. I tried below code and it worked. I have already checked with latest drivers, but still error is same. On other machines its working. Even it was working on my machine before I tried remotewebdriver. I tried using latest selenium jar 2.42 as iedriver exe. but still issue is the same. Is related to something I tried with remote webdriver?